Carson Wentz shouldn't be worried about suffering from a "sophomore slump." One sentence. Three words, really. That's all it would take to accurately explain why Eagles quarterback Carson Wentz won't regress in Year 2. That's right, you heard it here first: Wentz will be better in 2017 than he was in 2016. 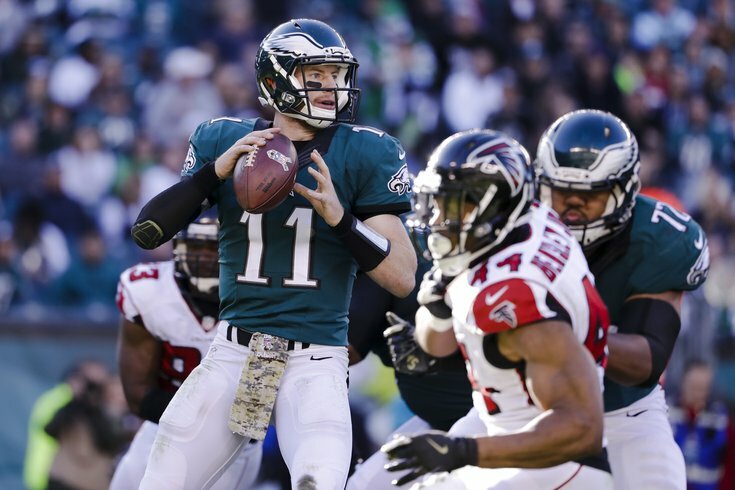 Eagles Mailbag: What is Carson Wentz's ceiling? • Certainty: Wentz already knows he's the starter. He'll get the first team reps in training camp. Last year, he was splitting them with Sam Bradford and didn't even know he was the starter until eight days before the season opener. • Consistency: Not only is Wentz going to enter his second season more prepared, but he's going to do so with five familiar faces in front of him. The importance of that cannot be understated, especially given how much better Wentz looked in the weeks when he had his whole starting line active. Unfortunately that wasn't very often due to Lane Johnson's 10-game suspension. • Company: Even if Wentz doesn't improve his own game from season to season (which, again, is highly unlikely), he's already in a better position due to the wideouts around him. Alshon Jeffery, Torrey Smith, and a few new draft picks should help him quite a bit. Oh, and when they need one yard to keep a drive going, they'll be handing it off to LaGarrette Blount, who is roughly three and a half times the size of Darren Sproles. Last year, Sproles was tied with Ryan Mathews for the most first downs on 3rd/4th and short and had the best conversion rate on the team. While those are all fairly obvious reasons, they don't guarantee Wentz avoids the dreaded "sophomore slump." And I promised a guarantee. In fact, I believe it was a three-word explanation. Ready? "Sophomore slump" is a phrase people like to throw around without ever taking the time to see if it's actually a real thing. It's simply a way to label something that doesn't otherwise make sense or – and this is the one that really bugs me – to build a false narrative about a certain player. The majority of times a player is hit with that moniker in his second season, it often fails to account for any number of environmental factors, those out of the QB's control, that could be affecting his play. Other times, a player has such an impressive rookie season, that an average year suddenly looks like a slump. Careers wax and wane, sometimes that happens sooner rather than later. But when was the last time you saw a quarterback (or any player at any position in any sport) follow a perfect career arc, where their stats incrementally improve year-over-year until they peak, then slowly decline each year thereafter, until retirement? Furthermore, when talking about guys like Wentz – for the sake of this story, that means quarterbacks who were drafted in the first round and started at least 12 games in each of their first two seasons – there's rarely a drop-off of any kind in Year 2. As best I can tell, there have been 13 such players that fit that description since 2004. They are: Ben Roethlisberger (drafted in 2004), Vince Young (2006), Joe Flacco (2008), Matt Ryan (2008), Mark Sanchez (2009), Cam Newton (2011), Robert Griffin (2012), Andrew Luck (2012), Ryan Tannehill (2012), Blake Bortles (2014), Teddy Bridgewater (2014), Marcus Mariota (2015), Jameis Winston (2015). Of those 13 quarterbacks, just two (Matt Ryan and Robert Griffin) saw their passer rating decline in their second season. In the case of Griffin, that decline was due to a couple of factors. First, his rookie season was bonkers. It was going to be hard to top that. Second, he was playing injured, causing his rushing numbers to take a hit and in turn allowing defenses to focus on his arm rather than his legs. As for Ryan, he may be the only one who actually had a sophomore slump, but there certainly could be other factors I'm currently forgetting that contributed to the drop in his stats. Even with that dip, Ryan's passer rating remained above 80 on the season, which is still better than what Wentz posted in his rookie year (79.3). Griffin's rating, which dropped by a ridiculous 20.2 points in his second season, also remained above 80, thanks in large part to those aforementioned rookie numbers. And that's the point here. Just one* of the 13 quarterbacks listed below posted a sub-80 passer rating in their second season. And when you add that to the other things he has going for him – certainty, consistency and company – there's no reason to think Wentz will be the outlier. *Vince Young posted a 71.1 rating in his second season (2007), but that was still an improvement over his rookie season (66.7).